Indigenous and local communities often become involved in one-sided agreements, rather than equitable partnerships. Collaboration between agricultural scientists and farmers, such as participatory plant breeding and reciprocal access agreements, can bring important benefits for both sides. In the examples below, the communities’ genetic resources have been enriched to increase resilience and food security in the face of climate change; and the genetic basis of agricultural institutes has been enriched for future plant breeding. Participatory plant breeding involves farmers and other stakeholders in setting breeding objectives, making crosses, developing finished varieties and releasing these. It aims to improve crop varieties, enhance agro-biodiversity, empower farmers and communities, and influence regulations and policies. Both farmers and breeders contribute knowledge and genetic resources to the process, hence the benefits must be shared equitably. Agreements for access to genetic resources and benefit-sharing (ABS) usually entail the flow of genetic resources away from communities to others. Reciprocal access agreements centre on a two-way exchange of genetic resources and knowledge, following the customary principle of equal exchange (reciprocity). In the remote mountain areas of South West China, farmers are very poor and don’t have enough land to produce food. In the last decade, high yielding hybrid maize has been planted, but this has led to a rapid decrease in planting of local, more resilient, varieties. Since 2000, the Centre for Chinese Agricultural Policy in China has been helping farmers improve maize varieties in Guangxi province. The aim is to bridge two separate seed systems—the farmer and formal seed systems. When farmers join the participatory plant breeding programme, they are also encouraged to manage their plant genetic resources and conserve traditional knowledge. Farmers are empowered by capacity building and knowledge sharing with and amongst local communities. So far, more than 80 varieties have been used in participatory plant breeding trials on research stations and in the field. Four farmer-preferred varieties have been selected and released in the research villages, and have now spread beyond these villages. In addition, five varieties from CIMMYT (a maize breeding institute) that were showing increasingly poor results have been adapted to local conditions, and another five landraces from the trial villages have been improved. Agronomic traits, yields, taste, and palatability of all these varieties are satisfactory. These varieties are also showing better adaptation to the local environment than modern hybrids. For farmers, participatory plant breeding has broadened access to seed and exchange networks. Poor farmers have benefited from free seeds for each season. For the agriculturalists, the genetically diverse landraces will help with future breeding programmes. Public institutes have collected more than 120 maize landraces from Yunnan, Guizhou and Guangxi for further research and improvement. Provincial governments are now supporting participatory plant breeding in some areas. As varieties are developed jointly, both professional breeders and farmer breeders have rights to benefit-sharing. Clear and systematic benefit-sharing agreements between local communities and breeders are needed before collaboration starts. In June 2010, two types of benefit-sharing agreement were established. The first is for the conservation of local landraces for future breeding, recognising that these are the product of farmer knowledge. The second recognises farmers’ contributions of genetic resources and knowledge to the participatory breeding process. These pilot agreements can help to establish new models for prior informed consent and access and benefit-sharing policy in China. In the high Andes, Quechua communities depend heavily on the diversity of potatoes for nutrition and agriculture (eg frost and drought resistance), but this diversity has been in decline. With the impacts of climate change – eg. shrinking of snow caps that provide essential water – revitalizing potato diversity has become critical. 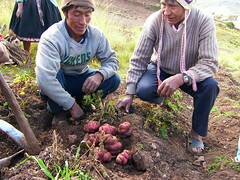 In December 2004, the Association of Potato Park communities (representing the six communities) and the International Potato Centre in Lima (CIP) signed an agreement on the Repatriation, Restoration and Monitoring of Agro-biodiversity of Native Potatoes and Associated Community Knowledge Systems. 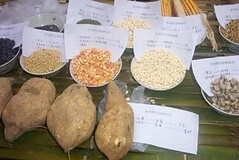 The agreement aims to strengthen agrobiodiversity in the park for nutrition and food security, through collaborative research and the return of potato varieties collected in the 1960s (which have since been lost). Over 400 disease free potatoes have been returned and the International Potato Centre agreed to pay back a share of the money made from past use of these varieties. This landmark agreement establishes an equitable model of access and benefit-sharing which reflects the customary principle of reciprocity (equal exchange). It is also a significant step in the protection of community rights – the International Potato Centre not only returned potato varieties to the communities, but also agreed not to allow any patents on the varieties from the Park, which are effectively ‘repatriated’. Following the success of this agreement, the Potato Park communities signed a follow-on agreement with the Centre in December 2010. This will help the communities send seeds from their native potatoes to the Svalbard Seed Vault, and produce a set of seeds to be used by the communities to develop climate-ready potatoes. These agreements provide important models for other CGIAR institutes and agricultural institutes to address the interlinked problems of agrobiodiversity loss, rural poverty and hunger and climate change, and meet related international commitments. The model of reciprocal access could equally be used by botanic gardens to improve in situ conservation of medicinal plants for health security. Protecting indigenous knowledge against biopiracy in the Andes. Alejandro Argumedo & Michel Pimbert (2006). 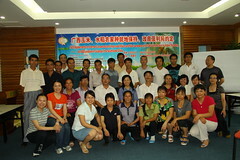 Seeds and Synergies: Innovating rural development in China. Edited by Yiching Song and Ronnie Vernooy (2010). Practical Action and IDRC. Biodiversity and Traditional Knowledge: Equitable Partnerships in Practice. Edited by Sarah Laird (2002). Earthscan.